Alarie Tennille was born and raised in Portsmouth, Virginia with a genius older brother destined for N.A.S.A, a ghost, and a yard full of cats. A Phi Beta Kappa, she graduated from the University of Virginia in the first class that admitted women (B.A. with distinction in English). She met her husband, graphic artist Chris Purcell, in college. They live in Kansas City, Missouri, where Alarie serves on the Board of Directors of The Writers Place. Her poems have appeared in numerous journals, including Poetry East, Margie, ByLine Magazine, English Journal, I-70 Review, Coal City Review, Kansas City Voices, The Mid-America Poetry Review, Little Balkans Review, Touch: The Journal of Healing, and The Kansas City Star. Alarie’s childhood was a blur, but what she couldn’t see of the world, she pictured by ear. Her parents shared the Southern knack for storytelling – long, meandering tales she asked to hear again and again. There was usually dance music in the back-ground, the sounds of cicadas, and the clink of ice in glasses of sweet tea. Weekends brought rolling surf and laughing gulls, and the calliopes of amusement park rides. Then she got glasses and discovered new worlds in books and paintings. One night Mama was washing dishes with her back to me. I was about eight. I read ‘The Mouse Family’s Christmas’ to her. When she turned around to dry her hands, she saw that I was holding notebook paper covered with my giant scrawl. ‘I thought you were reading from a book!’ she exclaimed. I was so proud! Then at ten, I had to write a five-page paper on ‘Why I Should Not Talk in Class.’ I was at a new school and very shy, but I made friends that day and learned that my writing could make other kids laugh. The South and the coast mean more to me now that I’ve been so long away from them. I planned to write childhood memoirs one day, but was quite surprised when they began pouring out in poetry. My poems continue to lead me in new directions, and I’m very grateful for that. I am often amazed by the strength of the human spirit and the unwillingness to give up and give in. We possess the ability to go on in spite of the obstacles thrown at us by fate and the life into which we are born, but this isn't always easily accomplished. We witness or are made aware of dramatic examples of this strength through the news and by the articles and stories we read every day, but what we don't hear about are the private struggles and the personal triumphs accomplished in everyday life by everyday people. Illustrated by Alarie Tennille's keen eye for observation and told with honesty and clarity, the poems in this collection are written from her perspectives as a child, daughter, and woman. With a strength of character I can only define as determined optimism, Alarie inspires us to explore life as she pauses to take in the beauty of a moment or the starkness of daily realities, indulging our senses along the way. The title of this collection, Spiraling into Control, was chosen wisely. These poems take us on a journey through life, which while growing outward, remains bound firmly to the past. As you enter this collection, sit beside the poet as she experiences the works of Vermeer. Listen with her on a sultry August afternoon to the chirp of crickets and the hum of air conditioners. Savor the salty lusciousness in the memory of a BLT made with homegrown tomatoes. Sense the tickle of a persistent ant, who lost between his nest and spring peonies, dreams of weightlessness. And recoil from the pungent tang of a disheveled 2nd grader, who learns of joy from the author's heart songs. Travel with Alarie and witness the unfolding of life; seen through the eyes of a poet who lives with the intention to relish each moment, who is dedicated to learning from each encounter, and who is determined to grow with each accomplishment. “Plenty to eat, but nothing to waste,” writes Alarie Tennille in a poem about the Depression. Likewise, all the poems here offer feasts of words without even one word wasted. “Doors swing open,” she says and we pass through to see swimming elephants experience “joy and surprise that the burden of gravity has been lifted.” We travel to Gee’s Bend to understand how quilters created art amidst poverty, and we visit the ancient timbered houses of Troyes whose “mortal wood grows weary.” Graceful and vivid, often containing unexpected questions and images, Tennille’s poetry makes us want to come back for more. 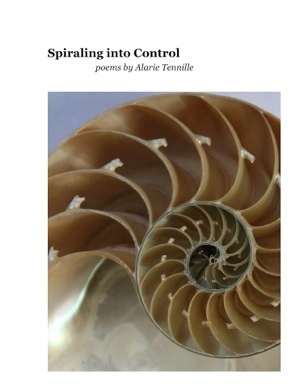 In Spiraling into Control, Alarie Tennille delivers that rare, good thing in contemporary poetry—clarity—and it resonates throughout the work like the ring of fine crystal. Firmly rooted in a place and time, the poems speak of the ordinary (ants, convenience stores, tomatoes) turned incandescent. Enjoy these poems for their subtle wit; treasure them for their compassion. They will take you deeper into your life. In Spiraling Into Control, Alarie Tennille travels through time and looks back, as if having “come full circle” through a nautilus. From learning to keep things inside and coping with a lack of vision, she ultimately triumphs over whatever part of herself she lost or covered up. She emerges fully with a keen sense of how to express herself with apt and vivid details and sensory images. God is “in the details” of many of these poems as she pays tribute to the common spider “sliding down the first strand of morning,” to swimming elephants: “their trunks curl upward/snorkeling air and waving/hallelujah,” to the single ant having made his “peony pilgrimage” “returning, praying/I will again blow him/aloft, longing for the/rapture of flight.” She pays tribute to family fishing trips, her father’s “platoon” of tomatoes he gives away to family and friends, to common folks “making do” like the quilters of Gee’s Bend. Alarie Tennille makes the world come alive through language that lingers. These poems do much more than “get by.” They do what good art should do—they take us places, introduce us to living creatures and people, and touch us in ways that make us remember them long after we read the last lines. I believe we find art at the intersection of memory and imagination. It is the task of poets, especially, to map out their own experiences, to travel that great road of the soul. On this road we will, if we live fully, find everything from epiphany to melancholy. It takes courage to live; it takes even more bravery to write about living. Alarie Tennille has a poet's fearless heart. "I must choose," she writes in one of the poems here, "what is worth keeping." Spiraling Into Control is worth keeping.